Originally believed to have been a North African dish, Shakshouka appears on every breakfast menu in Israel, as it is believed to be the best way to start the day. Made of eggs, poached in a rich sauce of tomatoes, chilli peppers and onions, spiced with cumin, it is traditionally cooked in a cast iron skillet or tagine and brought to the table piping hot. The tomato sauce can vary in its spiciness depending on taste, but the timing of the eggs is crucial, perfected by all Israeli chefs to ensure the whites of the eggs are just set, but the yolks soft and still runny. Other ingredients are often added to the basic recipe, including preserved lemons, feta, harissa paste and fresh herbs, varying the balance of saltiness, sweetness and spice to the sauce. Tunisian cooks may add artichoke hearts, potatoes or broad beans, making it a heartier meal than breakfast. In Israel it is always served with thick hunks of bread to mop up the delicious juices, together with an Israeli salad of finely diced tomatoes and cucumber. 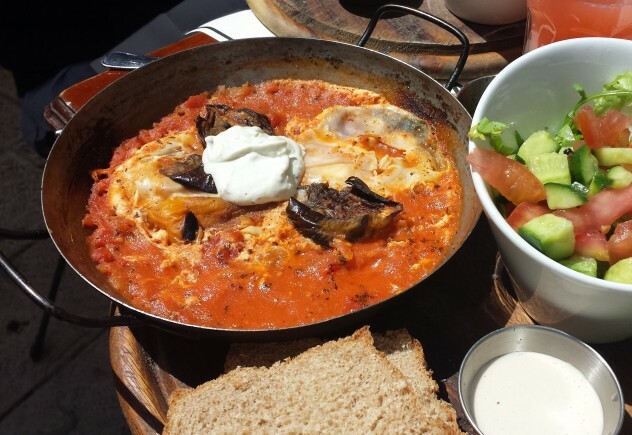 In Hebrew the word Shakshouka means ‘all shook up’, devised from the verb ‘leshashek’, meaning ‘to shake’. Other meanings or origins of the word include ‘a mixture’ in Arabic, or ‘a vegetable ragout’, from the Moroccan Berber word, Chakchouka. Whatever, it’s meaning, pronunciation or spelling, it is truly believed not only to be a wonderful way to start the day but healthier than the fried breakfasts eaten in Western parts of the world today. in a large saucepan, dry-roast the cumin on high heat for two minutes. add the oil and sauté the onions for two minutes. Add the peppers, sugar, bay leaves, thyme, parsley and two tablespoons of coriander, and cook on high heat to get a nice colour. add the tomatoes, saffron, cayenne, salt and pepper. Cook on low heat for 15 minutes, adding enough water to keep it the consistency of a pasta sauce. Taste and adjust the seasoning. It should be potent and flavoursome. place four saucepans on medium heat and divide the mixture between them. break two eggs into each pan, pouring into gaps in the mixture. Sprinkle with salt, cover and cook very gently for 10-12 minutes, until the egg just sets. sprinkle with coriander and serve with chunky white bread.